It is possible that a bulb is incorrectly installed, affecting headlight aim. Bulb installation should be considered prior to performing the adjustment procedure. Ensure there is no damage or deformation to the body around the headlights. (a) Adjust the headlight aim in accordance with the headlight aim test machine instructions. Place the vehicle in a location that is dark enough to clearly observe the cutoff line. The cutoff line is a distinct line, below which light from the headlights can be observed and above which it cannot. 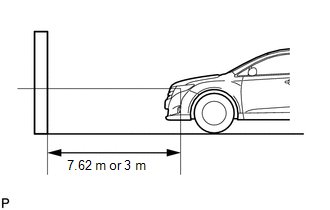 Create a 7.62 m (25 ft.) distance between the vehicle (headlight bulb center) and the wall. 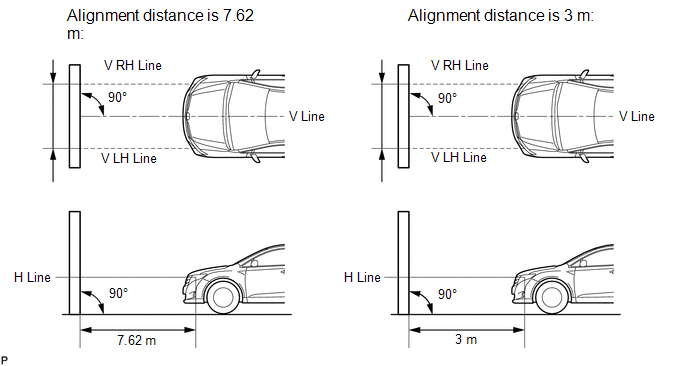 The base lines differ for "low beam inspection" and "high beam inspection". Mark the headlight bulb center marks on the screen. If the center mark cannot be observed on the headlight, use the center of the headlight bulb or the manufacturer's name marked on the headlight as the center mark. Draw a horizontal line across the screen so that it passes through the center marks. The H line should be at the same height as the headlight bulb center marks of the low beam headlights. Draw 2 vertical lines so that they intersect the H line at each center mark (aligned with the center of the low beam headlight bulbs). (a) Cover the headlight or disconnect the connector of the headlight/headlight ECU on the opposite side to prevent light from the headlight that is not being inspected from affecting the headlight aiming inspection. Do not keep the headlight covered for more than 3 minutes. The headlight lens is made of synthetic resin, which may melt or be damaged due to excessive heat. When checking the aim of the high beam, cover the low beam or disconnect the connector. (c) Turn the headlights and check if the aiming of each beam. Since the low beam light and the high beam light are a unit, if the aim on the low beam is correct, the high beam should also be correct. However, check both beams just to make sure. The left half of the low beam cutoff line should be within 101 mm (3.97 in.) above or below a line drawn 53 mm (2.09 in.) below the H line (SAEJ599). The left half of the low beam cutoff line should be within 39 mm (1.56 in.) above or below a line drawn 21 mm (0.825 in.) below the H line (SAEJ599). The high beam center of intensity should be within 101 mm (3.97 in.) above or below the H line (SAEJ599). The high beam center of intensity should be within 39 mm (1.56 in.) above or below the H line (SAEJ599). The left half of the low beam cutoff line should be 53 mm (2.09 in.) below the H line (preferred cutoff line target). 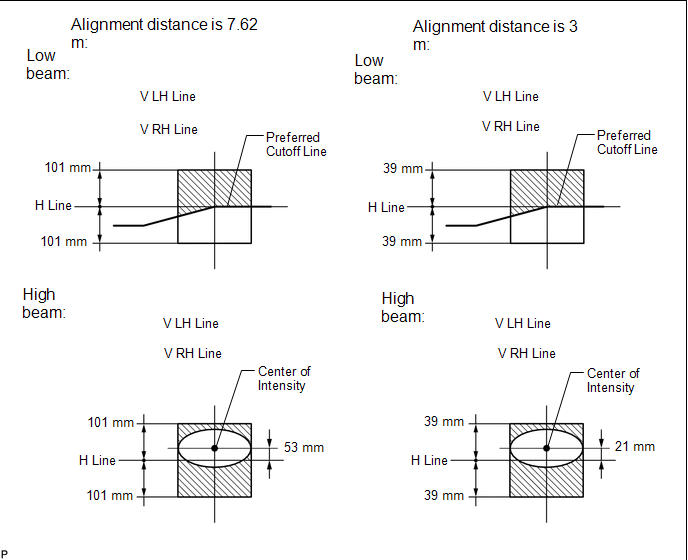 The left half of the low beam cutoff line should be 21 mm (0.825 in.) below the H line (preferred cutoff line target). The high beam center of intensity should be on the H line (preferred center of intensity). The right half of the low beam cutoff line should be within 101 mm (3.97 in.) above or below the H line (SAE J599). 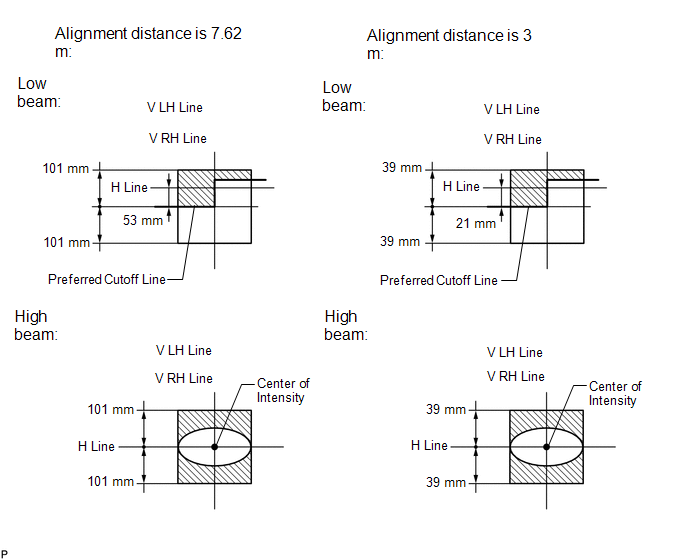 The right half of the low beam cutoff line should be within 39 mm (1.56 in.) above or below the H line (SAE J599). The high beam center of intensity should be within 101 mm (3.97 in.) above or below the H line (SAE J599). The high beam center of intensity should be within 39 mm (1.56 in.) above or below the H line (SAE J599). 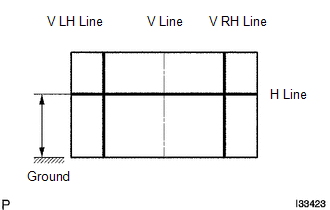 The right half of the low beam cutoff line should be on the H line (preferred cutoff line target). The high beam center of intensity should be 53 mm (2.09 in.) above the H line (preferred center of intensity). The high beam center of intensity should be 21 mm (0.825 in.) above the H line (preferred center of intensity). (a) Remove any covers necessary to access the headlight adjusters. Adjust the aim of each headlight to the specified range by turning each aiming screw with a screwdriver. The low beam light and the high beam light are a unit. Adjusting the aim on the low beam to the correct position should also result in the high beam adjustment being correct. If it is not possible to correctly adjust headlight aim, check bulb, headlight unit and headlight unit reflector installation. The headlight aim moves down when turning the aiming screw clockwise, and moves up when turning the aiming screw counterclockwise. Confirm the direction of rotation of the aiming screw by observing it while it is being adjusted. Due to the position of the screwdriver, the direction of rotation of the adjusting screw can be different than the direction of rotation of the screwdriver being used to adjust it. (c) Install any covers that were removed to access the headlight adjusters.